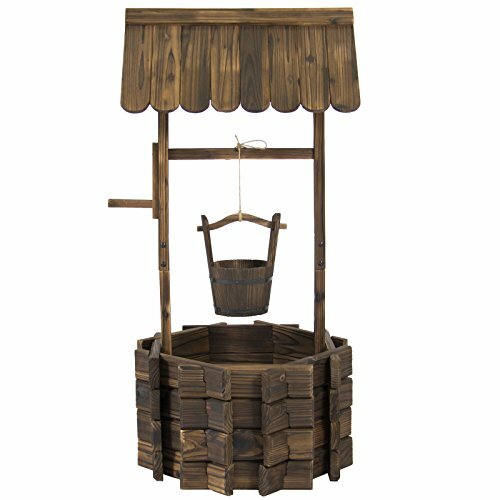 Product is proud to present this brand new Wooden Well Planter. This lovely water well planter will add an elegant and stylish look to your lawn or garden. It has a burnt-like wood finish for a rustic appearance. The well is constructed of solid fir wood that will keep this planter durable and long-lasting. With its 16.5" diameter, the well will be able to hold multiple plants at once. The detachable bucket can also be used to hold smaller plants. The included string allows you to hang the bucket as low or as high as you'd like. Purchase this one of a kind planter to give your lawn or garden a whole new look.